The screenshot above is hosted and provided by advscheduler.com. Please contact them directly for any copyright infringement as we are not responsible for that content. Last Update: 2018-06-18 - Major Update: Task scheduler includes the following changes: "File watch" schedule type enhanced, Minor improvements and bug bug fixes. Requirements: A computer running under Microsoft Windows 2000/XP/Vista/7/8/10. Server can be installed as service on a network server, embedded system, PLC, terminal server, web server and any other remote system that can be connected by TCP/IP protocol. The service is working in the background, enabling all scheduled tasks to run smoothly without taking up any desktop space. This feature means Advanced Task Scheduler can be run even when no user is logged on. 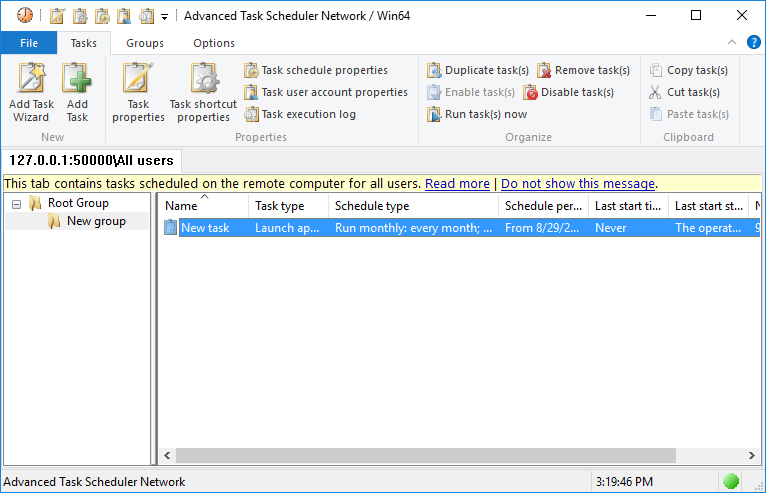 Advanced Task Scheduler Network automates a diversity of tasks: launch programs, scripts and batch files, open documents and web pages, display popup messages/reminders, play sounds, send messages, shut down and restart your computer, establish and close dial-up connections, perform FTP and file system operations and much more. Advanced Task Scheduler offers a full set of scheduling tools that allow you to run scheduled tasks automatically, as a one-off, a specified time after system startup, or secondly to yearly. Alternatively, set tasks to run via a hotkey, on computer idle, on network connection being established, on user log-on/off, program start/stop, you can use login-watch, window-watch, process-watch and file-watch features, run-on-holiday function, randomized time and much more. Unlimited number of clients can connect the server at the same time by secure SSL connection so that the data cannot be deciphered by the third party and the data remains confidential. Additionally, Advanced Task Scheduler Network allows you to encrypt your settings and tasks so only authorized clients will be able to connect. Try Advanced Task Scheduler Net for free today.